Kahla Ishoy is living a dressage legacy while forging her own path. Most of us will never forget our first ride. Perhaps it was a pony ride at the local fall fair, or at a neighbour’s farm, or even on the coin-operated horse outside the supermarket. The first ride Kahla Ishoy can remember, however, was a little bit different. As the daughter of Olympic dressage medallist Cindy Ishoy and the late Neil Ishoy (a celebrated trainer and grand prix competitor in his own right) Kahla’s childhood memories are the stuff dressage dreams are made of. Even at that young age, Kahla, now 34, knew she wanted to ride. “I got my first pony, Bijou, when I was four years old,” she recalls. “That pony sent me flying more times than I can count! I stopped riding for a little while during high school, but got back into it more seriously when I was about twenty. I actually transferred from Western University to McMaster University so that I could continue riding. I guess I came to terms with the fact that it’s in my blood! Under the watchful eye and careful training of her parents, Kahla has developed not only into a world-class rider, but a highly-skilled trainer as well. She garnered national attention riding in the 2017 Carl Hester masterclass held near Toronto aboard San Remo (Sakima), her mother’s 10-year-old Brandenburger gelding. 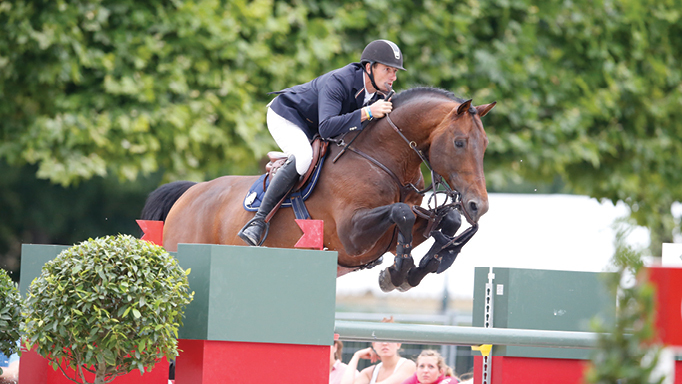 In 2018, the pair made their FEI debut, achieving solid competition results throughout the season at the PSG and I1 levels. 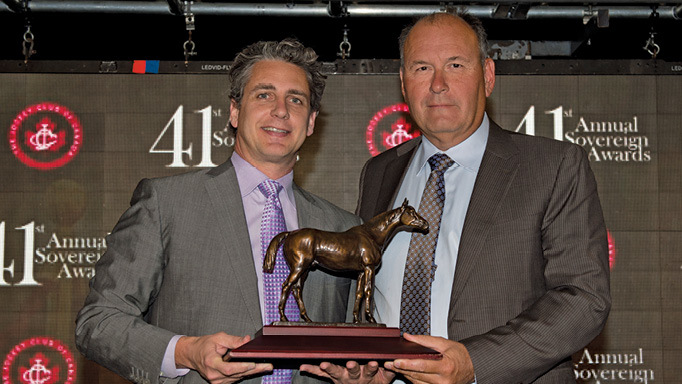 “San Remo is just an amazing horse,” Kahla says. 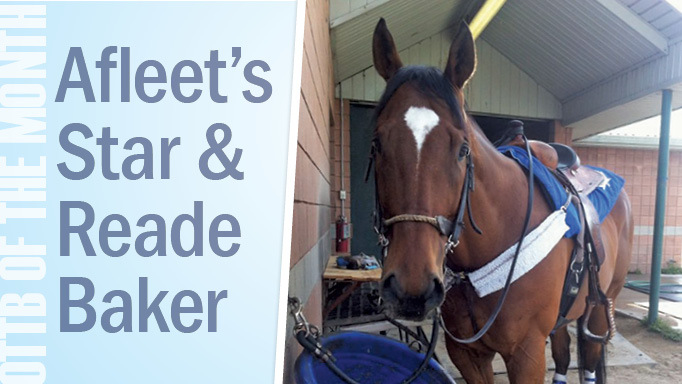 “He is so easy to work with and is most definitely a barn favourite. He’s like a puppy dog; he will follow you anywhere and just wants attention. In addition to her competitive achievements, Kahla is increasingly in demand as a coach and trainer – a role she finds as gratifying as competing herself. She enjoys working with a wide range of horses and riders, and sharing the knowledge she’s gained over the years. “I love seeing people improve, and seeing that moment when something clicks,” she says. “I also like the challenge of tailoring the same basic training methods to suit each horse/rider combination. Everyone learns differently and has a different style of riding, so as a teacher, it’s my job to ensure that they’re understanding what I’m teaching. She describes her program. “Everything I teach stems from the German classical system: systematic, gymnastic training and the six steps of the training pyramid. My overall goal is to ensure that both horse and rider understand the mechanics behind whatever it is that we are working on, and that the horses are happy, healthy, and doing the movements with ease. “I promote cross-training to my students and definitely follow my own advice. It’s so important that riders go to the gym to not only improve their own fitness. but also to understand muscle mechanics, how muscles get tired, and that conditioning is extremely important. Horses aren’t robots; they’re athletes, just like us. They need to build strength, endurance and power, just like we do. These things don’t happen overnight, but rather develop through a consistent training program. I have high expectations and want to push people beyond what they think they are capable of. While Kahla’s training philosophy certainly comes from her legendary parents, it’s not the only gift they have given her. “I think one of the most important things that my mom has passed on to me is her work ethic. One of her favourite sayings is ‘If you want the ribbons, you need to put in the work.’ She pushes me outside of my comfort zone and emphasizes that you need to be passionate about what you do. She is most definitely my rock. If I have a problem, she is the one I go to, both with riding and on a personal level. While she is my trainer, she is also my mom. Making time for fun is no small task. An average day sees Kahla riding at 6:30 a.m. before spending the day at her job with the Ministry of the Attorney General. After work she hits the gym to work on fitness and strength, and then it’s back to the barn to teach her clients in the evenings. 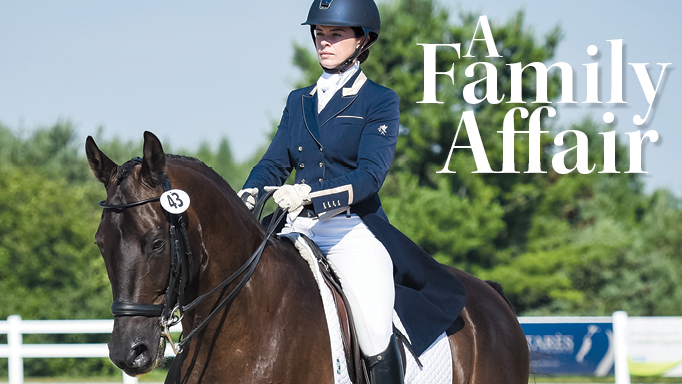 With so much on her plate and a last name that’s akin to dressage royalty in Canada, it’s fair to wonder whether Kahla feels added pressure to succeed. “I would like to be able to say no, but realistically, yes,” she admits. “In fairness, I think that it’s both external and internal pressure. When I compete, I don’t want to disappoint my mom or myself. She has high expectations and is a perfectionist. Those are the qualities that got her to where she is today, and qualities that she has passed on to me. When I come out of the competition ring she is always supportive and positive, but is quick to point out what needs to be improved. Those are the comments that I thrive on. I always want to know what I can do better, what I need to fix. She always knows how far to push me to be a better rider and competitor. Sometimes it’s not always what I want to hear, but what I need to hear. Meet Saul McHugh, the man behind the successful training business, Global Equine Limited. Gregory Wathelet is not afraid to work long days and take risks on his road to success. The life-saving tale of how Buttermilk earned his name.